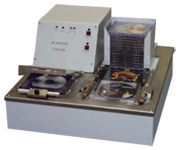 The CDC100 Cello Wrapping Unit for CDs is specially designed for a professional wrapping of CD jewel cases. The CDC100 cell wrapper offers a finishing similar to the one obtained in industrial wrapping. Suitable to wrap medium quantities of jewel cases, it is fast and has a simple use in a minimum space. Place the pre-cut polypropylene sheet into the folding tray. Insert the jewel case box and close the tray (automatic tension). First sealing is made by pushing the resistance for a few seconds against the jewel box. Drop the cases and place it into the hopper, you can fill it up to 15 jewel cases. Then press the start button and the latest folding and sealing operations are automatically done.